Su recorrido de día completo de la impresionante garganta del Rin comienza a su propio ritmo desde Coblenza. Dependiendo de su programa de vacaciones, puede elegir un recorrido por la mañana o por la tarde, a continuación, desplácese por sus propios medios hasta el punto de embarque, cerca de la Deutsche Eck en el paseo del Rin. Suba a bordo del barco de KD barco turístico y tome un cómodo asiento en la cubierta exterior o en el amplio salón interior. La flota de San Goare dura aproximadamente 3,5 horas, por lo tanto, póngase cómodo, escuche las interesantes narracionas y podrá admirar las hermosas vistas de castillos, fortalezas, los viñedos, pueblos rústicos y el impresionante risco de Lorelei, una mítica pizarra de roca que sobresale 130 metros (427 pies) desde el río. Baje del barco en el bonito pueblo de San Goare. Tanto tiempo como desee explorar la ciudad para comprar recuerdos, como una firma reloj de cuco, pruebe la cerveza local o disfrutar de una relajante comida (por cuenta propia). Para disfrutar una dosis de arquitectura medieval alemana, compre una visita a Stiftskirche o al castillo Rhienfels. Cuando esté listo para salir, vuelva al muelle para el viaje de vuelta a Coblenza. Se incluye en su excursión de ida y vuelta pasaje en teleférico a Coblenza, la más larga de Europa fuera de los Alpes, y la entrada a la fortaleza de Ehrenbreitstein. Las entradas son válidas durante todo el día, por lo tanto, elija comenzar o finalizar su recorrido con este épico paseo hasta los 850 metros (2.789 pies) de altura. Desde esta posición estratégica, maravíllese con unas inmejorables vistas de esta garganta declarada Patrimonio, a continuación, tome su tiempo en esta excursión a la gran fortaleza y su museo histórico. This could have been a 5 star tour for me, but there was one serious problem. There is no way to see Loreley and Ehrenbreitstein in one day!!! I was advised to go to Ehrenbreitstein first or else I would only have 30 minutes to see it after Loreley, so I did go to Ehrenbreitstein first. I took the later boat to Loreley, but it arrived just 30 minutes before the last boat in return! I wanted to see Loreley, and I didn't get to. If you do this tour, do your research, figure out which of the 2 attractions you want to see AND DON'T BE BULLIED INTO DOING WHAT THE RANDOM PERSON AT THE TICKET COUNTER DICTATES THAT YOU DO. Also, understand that this is really just 1 attraction, not 2!!! This one of the better Viator offerings we've ever had. Excellent value for the money. 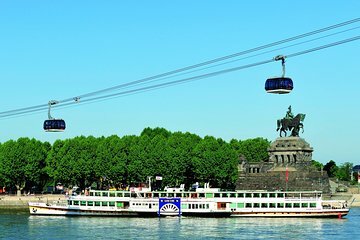 We were able to see some of the highlights of Koblenz, the Rhine, and the added value was the cable car ride up to the fortress on the hill overlooking the surrounding area at no additional cost. Only two issues, if addressed could make the experience better: Parking is horrendous if you drive into Koblenz for the tour. If Viator provided locations parking was available, it would certainly make it less stressful. Another issue was the lack of information about those sights along the river route. Providing that would enhance the experience just that much more. Otherwise, my wife and I loved it. We sat in the dining area, ate and drank while we viewed some wonderful sights in a relaxed and pleasant atmosphere. I would recommend this tour to everyone. How many castles can you stomach? Beautiful trip on the Rhine.....it is a 6 hour round trip....we cruised down to St.Goare...then jumped ship and caught the train back 25 mins.....it would be a great idea to have this as a package cruise one way...train back....this was ideal...another 3 hours back up the river...slightly painful with the same scenery... The fortress was excellent and totally recommend this for history buffs.. The information about the tour did not tell you that you had a three hour wait at St Goare before a boat could take you back to Koblenz. Additionally the Loreley Rock was really not part of the tour. St. Goare is before the Loreley Rock and to really see it you have to exit the boat the stop before St. Goare and walk quite a way. This was not explained, nor was there any mention of the Loreley Rock. That was disappointing. The cruise was a pleasant way to see the many sights along the Rhine. Viator info was incomplete and caused us to get a very poor deal. We got to Koblenz before the 2:00 cruise to take the cable car to the fort, but the KD kiosk was closed for a 1 Hr lunch. We had to purchase tix adding to cost. Excellent value for money,although the weather was a bit dull, there was plenty of sights to see and great photo opportunities. The crew were very helpful and attentive to our needs. Good food and drink made this a very pleasant trip. Recommended. Tour from Koblenz to St Goar was great. We also rode the cable car but didn't have enough time to explore. I would highly recommend both of these. We wanted to take the 9AM river trip. We got to the kiosk at 8:45 and it took until 9:10 before the line got to the front. We were then told that we had to take the 2 PM trip because you had to take the fortress trip first - there was no 9 AM river trip. Very confusing. End result was that we were not back to Koblenz until 8 PM and were unable to see the things we planned for the later afternoon when we thought we would be back from the morning cruise. Nice river cruise. Should have been more informed if the places to visit.